Backstory: Ever since stopping in at Portland's Voo Doo Doughnuts a few summers back, I've been rather obsessed with the burgeoning innovative and macabre donut scene. 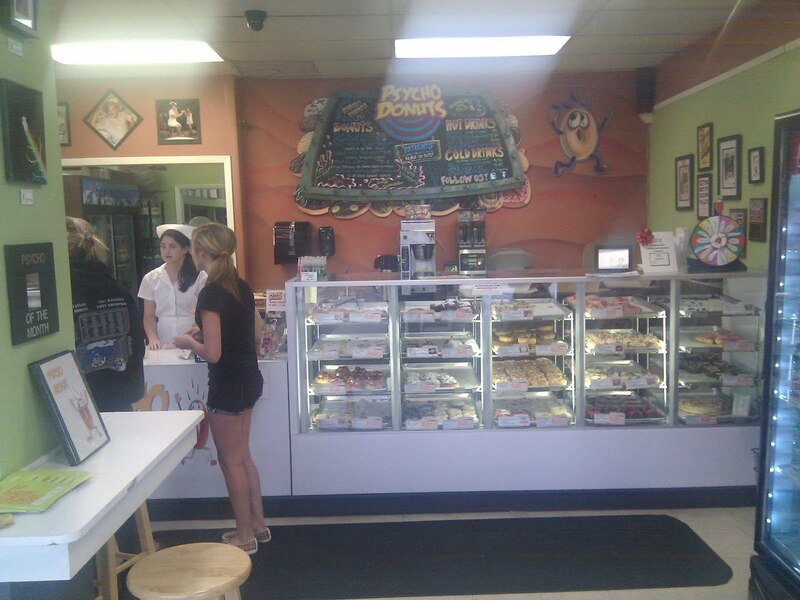 The Results: Psycho Donuts is a cool spot. 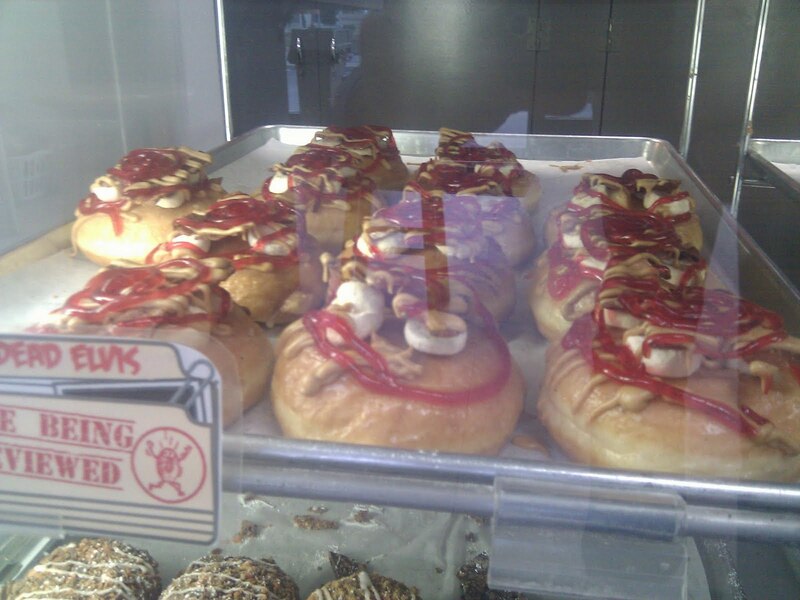 The donuts look cool. The flavor profiles are cool. The nurse scrub-adorned lady employees are cool. But, P.D. is not purveyors of the world's greatest donuts. Sure, they're above average, but they do not reach the donut pantheon of Voo Doo or more locally, Glendora's The Donut Man. 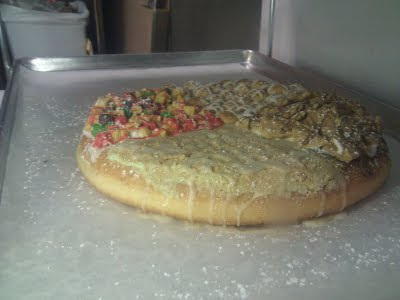 Although the flavors are as creative and weird as they come (The Arnold Palmer, for example), the cake tends to be on the dry side. But, honestly, that's okay. 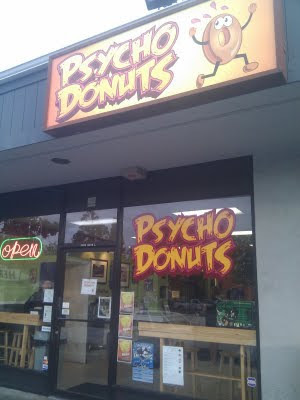 The allure of Psycho is not the expectation of a fine dessert. Rather, you come for the kitschiness and stay for the Willy Wonka-esque experience. Check out the menu: next time you're in Silicon Valley, you will definitely want to stop by. Lots of weird donuts. One nurse to take care of your every whim. 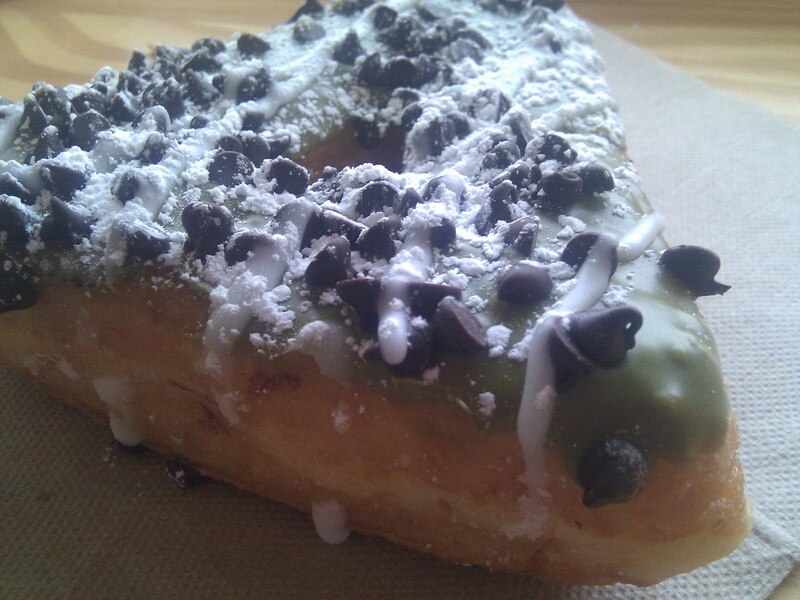 The Feng Shui (note: my personal favorite)- green tea icing with dark chocolate chips. 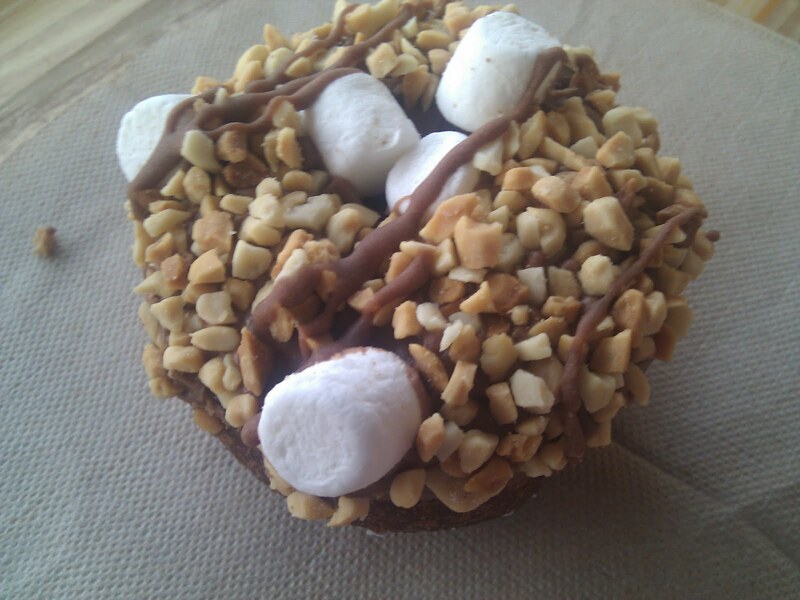 Rocky Road - chocolate cake, chocolate icing, peanuts and mini-marshmallows. 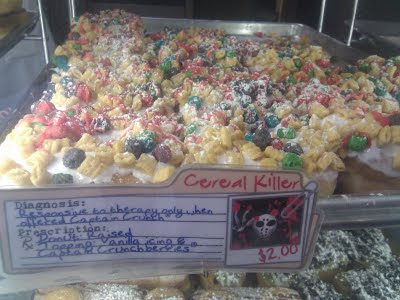 Cereal Killer - vanilla cake with vanilla icing and Cap'n Crunchberries. 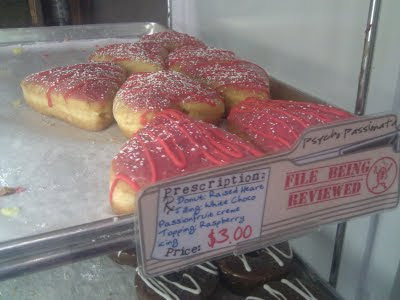 Pyscho Passionata - raised heart-shaped donut, white chocolate-passion fruit creme filling topped with a raspeberry icing. 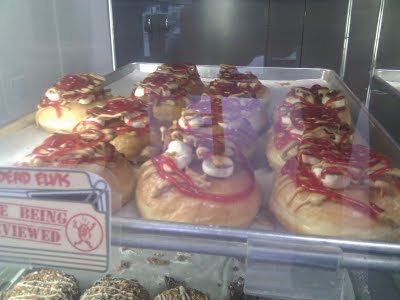 Dead Elvis - bananas, bacon, peanut butter and jelly. 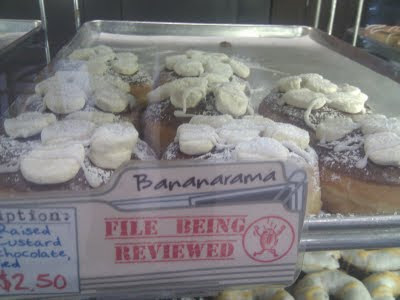 Bananarama - custard-filled with chocolate and freezed-dried bananas.